I believe I just barely reviewed one author’s take on the classic Arabian tale, One Thousand and One Nights, and the first thing I mentioned was how not many Western storytellers have retold that particular story. Now I’ve just finished another one. I know we haven’t produced many versions of it, but I’m amused that I ran into two of them practically back-to-back. Heh. Life has poetry to it, doesn’t it? A Thousand Nights, by E.K. Johnston, is a new take on the old story of a sultan murdering his brides until one bewitches him with her stories for a thousand and one nights in a row. The story presents itself as the truth behind the myth, so to speak, the original which inspired the tales told much later, and which have altered or exaggerated or forgotten parts of the truth, thus explaining as Johnston takes pieces of the story and rearranges them a bit. The novel follows a young woman, the latest bride of a desert king who has murdered all his previous brides, three hundred or more of them. Lo-Melkhiin, as he is called, has become a terrifying figure to his own people, yet the girl who becomes his newest bride chooses to do so. It’s an act of love, as she drew his attention to herself and away from her sister. She goes, and everyone expects her to die like all the rest… but she doesn’t. Somehow, she stays alive, to the wonder of all, including Lo-Melkhiin. It turns out, he does not simply kill his brides, but he drains them of their life force, and as she continues to survive such, he becomes bemused, and fascinated. Which… it is not always a healthy, happy thing to be the object of a monster’s interests. One version of this story I heard had the bride-killing sultan be suffering from madness, and another, more recently, had him the victim of a curse. Lo-Melkhiin is a victim here too, but of something far worse: possession. The man is a prisoner within a corner of his own mind, everything else having been taken by an immaterial creature, often referred to as a demon. Whatever it is, it has no value of human lives, or really anything at all except what it can take. That is all it does: take whatever it wants, do whatever it wants, simply because it wants to. Fortunately, it meets an unexpected match in its latest bride. Taken with the intent of just being another meal of energy, she proves herself to be far more, not least because of the love and hope that others place in her. She finds herself awakening to new powers, new abilities, and while they’re fascinating and useful, they’re never really explained. I got the sense that it had to do with weaving, spinning, praying, trances, sacred secrets, words and stories, and the power of creation, but there was never any actual explanation of her magic. As such, even as we got to know it through her experience with it, it felt very deus ex machina, especially near the end when she successfully uses it to win the war she finds herself fighting against all of her husband’s demon kin. If you notice that I’ve only referred to Lo-Melkhiin by name, without sharing the heroine’s name, well, that’s because it’s never mentioned. Lo-Melkhiin is one of only a scant handful of characters whose names are ever even mentioned. Everyone else is he, she, mother, father, sister, brother, brother’s child, brother’s wife, sister’s mother (their father has two wives simultaneously), father’s father’s father (they couldn’t ever use the word great-grandfather? ), Lo-Melkhiin’s mother, servant girl, baker, henna mistress, old woman, and so on and so forth. I don’t know if we ever even heard the main character’s name at all, even once. As descriptive and poetic as the language of this novel is, I found myself often wishing it was more precise and economical. Which, as one who appreciates flowery eloquence and vivid descriptions as the situation calls for such, says something. There is such a thing as too much of a good thing, and as good as the writing technically was, I still felt like it droned on a bit and overcomplicated simple things. Names, for instance. I very much enjoyed the themes, though. As descriptions, events, and dialogue progressed, we had, among other things, insights as to the nature of knowledge and intellect, a discussion of what men will tolerate under what circumstances, and an intriguing dichotomy of male and female powers at work. That, much more than any obnoxious choice of phrase, gave the story a rich texture that kept my attention riveted from beginning to end. I also like the inclusion of the supernatural creatures. That’s a personal interest of mine, and I enjoyed when I realized what each of these were. We have, of course, the demons, likely a reference to the jinn, though they usually have stronger associations with fire, so I could be wrong. There was a giant bird with silver talons, which I think was the roc of Persian mythology. It was a surprise when the end of the story became a creation story for several other creatures, which we can recognize as dragons, unicorns, the phoenix, satyrs, fairies, and one more that I couldn’t quite place, it might have been a goblin or a kappa or something else entirely. And, not a creature, but I appreciate the detail, I liked the introduction of iron into this ancient civilization, and introduced not only because it’s stronger than bronze, but because it hurt the demon within Lo-Melkhiin and all his kind. Finally, I like how the pieces of the old story are rearranged. The thousand nights refer to how long Lo-Melkhiin was possessed before his queen saved him. There were stories she told, but they were not told to him, and not every night. She was clever and brave and she earned the attentions of her demon husband and her human husband, but this was not what saved her. All pieces of the story, but not in any way that we have heard before. 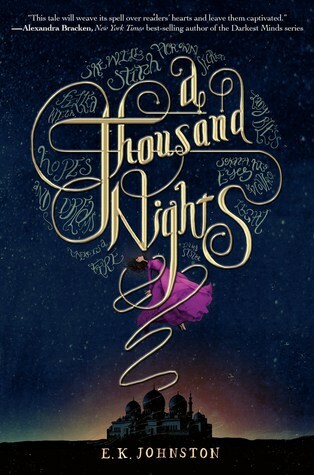 A Thousand Nights is generally an interesting story, a fresh take on a very old classic, set in an enchanting world. The language choice might leave something to be desired, and the magic system is very vague, but I still like it well enough. I understand there’s a sequel out, entitled Spindle, and I may pick it up at some point. This entry was posted in Books, Tuesday Review and tagged A Thousand Nights, E.K. Johnston. Bookmark the permalink.